I wasn’t just going by the MDS plot, but also by the ADMIXTURE proportions on the K12b runs. the La Braña individual is about as different from Gok4 (Swedish farmer) as he is from Avj (Swedish HGs). Stronly disagree here. If you got the component distances, you would find that brana is closer to the h/g than otzi after doing the math. But I’m not talking about Oetzi, I’m talking about Gok4, the Swedish farmer, on the K12b results the Swedish farmer was 81% Atlantid_Med and 5.5% North European, whereas each one of the Swedish Hunter-Gatherers were from 76.4% to 77.5% North European, and from 13.3% to 20.6% Atlantid_Med. The La Braña Hunter Gatherers were 45% Atlantid_Med and 41.6% North European. first, let me explain my reasoning for why I think otzi is part meso European. Again I wasn’t talking about Oetzi, but Gok4, Oetzi was 57.7% Atlantid_Med, and 22.3% Caucasus on the K12b results . The first assumption I make is that meso Europeans basically branched away from some homogeneous group, and that they only mixed with each other up to the neolithic. (I know that's not a great assumption). That would mean that meso Europeans are equally (or nearly so if my assumption is only a little off) related to the contemporaneous non Europeans. So if otzi is closer to brana than h/g swedes, then otzi must have some meso European. I actually think that it is possible for La Braña to have Atlantid_Med component, yet, for the component to be Neolithic. Here, let me explain how, for once, La Braña was only tested for 1000 SNPs on the K12b runs, so what this means is that out of the ~1000 SNPs 45% were Atlantid_Med like, now, Oetzi was tested for a lot more SNPs than that, so for all we know, only on those specific 1000 SNPs that are overlapping is that one could assign the Atlantid_Med component to a probably Mesolithic ancestry. Now the Atlantid_Med component has both Atlantid and Mediterranean components. The Atlantid_Med component found in Sardinians (which is 70.5%) is actually more akin to the Mediterranean portion than to the Atlantid portion. Oetzi was clearly linked to the Mediterranean world, so was Gok4, the La Braña individuals are clearly linked to NW Europe in the portion of their DNA thus far analyzed. Ok, so the reasoning I use to say that this theoretical x meso found in otzi/"atlanto-med" was not centered in meso iberia is as follows. The neolithic migration went from the near east, to the balkans, to Italy, and finally to Spain. Otzi and sardinians are about 100% "atlanto-med" and of this neolithic migration. For the mesolithic component in otzi to have been closest to the native iberian meso, would require that the balkans transfer little to no meso while Italy retains it's iberian meso like component during the neolithic. That alone would be a stretch. But even others have tied large scale migration to Italy from the east around the neolithic, leaving little room for western meso to dominate the meso that was there. That would suggest a good chunk of the meso in otzi, if its there, from the balkans. Actually neither Sardinians(70.5%) nor Oetzi(57.7%) were 100% Atlantid_Med, on the other hand Gok4 the Swedish farmer was 81% Atlantid_Med, and it is said that the culture that Gok4 belonged to was of Balkan origin, so yes, it is possible for the Mesolithic component on Gok4 to have come from the Balkans. Now the link between the Sardinians and Oetzi is also the presence of 22% Caucasus in Oetzi, and around that amount in Sardinians, on the other hand, Gok4(Swedish farmer) also had it, albeit at a lower percentage(4.2%). I am glad the fact that Atlanto-Med seems to be a mixture of western Meso and western Neo has been brought up. I dont have much of a clue about autosomal DNA but it does sound like it needs broken down into Atlantic-Meso and Med-Neo. Otherwise it doesnt seem to make any sense if its high in both Sardinians and in La Branca Meso. It sounds to me like its use is a bit limited until this is divided up. 1. R1b spread into the west in the pre-beaker copper age in low numbers related to specialist copper working and trade. 3. Still in pre-beaker mode P312 occurred in the western Alps. Some remaining there and soe moving west. 4. L27 occurred as these copper worker reached SW France and Iberia. 5. The network between them was established. 6. Along this network beaker spread back east from Iberia towards its fellow P312 groups along the west Med. as far as SE France and Italy. 7. The beaker network (pots or people, it wouldnt really matter if they were already a P312 group from pre-beaker days) eventually reached back to their more peripheral pre-beaker compatriots in the central Europe and the Rhine who had been there for centuries (and who had since experienced the U152 and L21). The latter pair had by then had a reasonable period of seperation before they were reconnected to their P312 compatriots along the Med. and gained beakers etc. 8. Finally the U152 and L21 groups underwent a massive seconary developed beaker expansion through central, Alpine and north Atlantic Europe. This alternative is possible although horribly low visibility and complex. However, it is better than a simple out of Iberia model. A simple out of Iberia or Iberian origin of P312 model just doesnt work because the DF27 SNP just downstream of P312 which dominates there means it cannot be ancestral to U152 and L21 which dominates P312 outside Iberia. The distributions make a lot more sense to me if P312 was located somewhere like the western Alps or SE France where all clades distributions kind of converge. I dont much like the model I have just posted because it seem almost as non-Occams Razor as is humanly possible and very low in visibility but it makes more sense that P312 originating in Iberia which looks (if you subtract L21 and U152 on its fringes) like a DF27 zone. The one thing simple phylogeny says is that what may have been a nearly exclusively DF27 zone in Iberia cant be the source of L21 and U152. Its far more likely that P312 occurred somewhere like the Upper Rhone or the western Alps and spread from there forming clades as it went - DF27 occurring as it moved west, U152 around the western Alps and L21 maybe as P312* headed from the Rhone into the Loire and Seine the Middle Rhine. Any out of Iberia aspect in the beaker era would surely be marked almost exclusively by DF27 and perhaps its most upstream subclades. Perhaps the large amount of early beaker in the west Med. of likely Iberian origin and the the very thin scatter of similar elsewhere is the totality of the material footprint of the genetic remnant of the out of Iberia early beaker element. I cant see how it is possible for it to be anything else. However, Iberia seems incredibly unlikely to be the source of the two great non-DF27 blocks - U152 and L21. Then that takes us back to the issue of L51* which even if not ancestral to L11 does (minus a couple of outliers in Ireland and east Germany) prefigure the early phase of the beaker network although with the difference that its strongest area lies well east of Iberia in France and around Italy. The comments upon the near-impossibility that P312 emerged in Iberia obviously as a consequence applies to L51* and L11* too. To me everything points to Iberia (at whatever stage) recieving a subset of P312 from the east in the form of DF27 and the origin of L21 and U152 having nothing to do with Iberia other than sharing a likely west-central/Alpine P312 ancestor. There are two solutions to this (assuming we are correct in focussing on the copper age, which seems reasonable with the current evidence), either there was a pre-beaker eastt-west spread or the most recent review of RC dates for beaker that had Iberia as the origin point is wrong. It would save us from the need for complex low-visibility models if the origin point of beaker was a little more to the east and would make a great deal of sense and keep Occam happy. That and long bitter experience of how views on beaker (even those based on detailed review of RC dates) keep changing because the spread was simply so fast. There are doubts about the certainty of the early Iberian dates due to the first half of the 3rd millenium falling into a wobble in the calibration curve. Also the selection of safe 'Gold Standard' short-life radiocarbon samples (typically bone) effectly means many areas with poor bone preserving conditions had to be ignored because there dates were from charcoal which might suffer from 'old wood effect'. It was an archaeologist backing the old Dutch model who raised this. Jean dismissed this out of hand but I dont think this paper deserves to be as it raised a very valid point indeed IMO. This point doesnt in any way mean a reversion back to a Dutch model because its not only Holland that would be effected by the twin issues of sample selection and radiocarbon calibration curves. Calibration makes a huge difference to dates (shifting uncalibrated dates in the 4th and 3rd millenium somewhere between 500 and 1000 years back depending on the detail) so its very important that it is right. All I am saying is we should be careful in building models for beaker based on R1b dates because it is a uniquely lightning spread and Radiocarbon has problems. So for me the evidence is not conclusive and radiocarbon may have met its match on this one and it probably will be solved by DNA rather than radiocarbon. With a few minor differences, that pretty much sums up the picture I have in my head. On the surface, it may look complex, but compared to human migration, it is probably over simplistic. Alan trowel hands calls West and Central Alps what I have called Italy. I am seeing that the name Italy isn’t liked, but this is the fact. I have said that the unique uncertainty I had was if these R1b were “Italians” or come from the Balkans. My theory of course is that they were autochthonous of Italy, for the pathway I have many times described in my posts and the expansion to West (but also to East) more ancient than it is usually thought and continued in the time. Of course to this only the aDNA will be able to answer. That is true. Problem is when it gets complex rather than a self evidence wave traditional archaeology will struggle to resolve it. Its not that it would be impossible for archaeology to resolve it though. Its just the sheer amount of data required from so many areas to make it clear-cut is hard to achieve and I think the DNA shortcut is much more likely to clarrify things before archaeology. Anyway to change the subject, I found this paper fro 2005 on beakers Galicia (the one in Spain, not Poland) fascinating. Its recent enough to have benefitted from the Muller and Willigen redating and so should still be very valid. I really like those regional studies of beaker. Frankly if the earliest dates for beaker had come from the Italian Alps or its border zone with Switserland and France I would have been delighted and it would have made life a lot easier as it wouldnt have required such complex pre-beaker and beaker models to explain R1b! Actually as our resident Italian expert I was wondering if you or anyone for that matter could point me to any online papers on beaker in Italy. ... BB did not seem to drastically change the cultural or genetic makeup of the Italian Copper Age (Remedello, Rinaldone and Gaudo). If you are looking for an exact match for the tall robust plano-occipital Brachycephalic types of Central Europe, you should look at the Gaudo Culture (3300 BC) skeletons found from Latium to Campania. They are an almost exact match to the Czech and German BB types as per a study I have. What are you trying to say about Beakers not impacting the Copper/Chalcolithic in Italy? Do you think Gaudo was pre-Beaker or a completely separate? I see Gaudo people had primitive copper tools. From what I can tell, it is slightly earlier than Bell Beaker. This brings to mind we (or at least I) probably have to be a lot more specific about Beaker types of cultures. I know there was a Rhenish version to go with what I guess would be an Iberian version but there are both geographic types and phases. As for DF27, I don't think its distribution is as weird as everyone thinks...it can only be found in places where studies show P312(xU152,L21). IMO, the distribution of DF27 will be a pretty good match for the Iberian BB expansion. I don't think DF27's distribution is weird, and we've talked about this before, but I think it is a little more scattered than L21 or U152, or at least L21, although there is still a heavy preponderance of DF27 in Iberia. I haven’t ever said that BB was born in Italy (I am not an expert of this) but only that Iberia was peopled by Italian agriculturalists by sea from at least 7500YBP and following millennia and that they carried to Iberia Cardial and Impressa and from those was born BB. I posted a few days ago about a site in Aragon (Spain) with samples of Impressa I think derived from Italy. Mine was only a discourse by a genetic point of view: R1b in Iberia derived from Italy, at least the R-L51 found in Valencia region and Central Portugal, perhaps the most ancient, and the R-P312* later. Italy has a few R-P312 as to Iberia, but, like always, it gets the most ancient haplotypes. Of course hg.G and E may have come from Italy too. As I have always fought against those who think that migrations happen like a one-way only as to the link with Middle East, I have always said that probably there have been also migrations from Iberia to Italy: R1b1* is well represented in Iberia and also in the Isles, like R1a/M420, but only aDNA will answer as to the place of origin. Yes. I remember when L21 was first discovered (2008) and fledgling google maps were made from early FTDNA L21+ results. Ireland seemed like it was soon covered in blue pins. Scotland was close behind. It was a while before L21 results were seen on continental Europe (eg. NW France and western Scandinavia) in any numbers. By contrast, DF27 is well represented in FTDNA continental European results from the beginning, even considering the same British Isles bias that FTDNA projects have. Among the small number of results since May 2012 there are DF27* from Spain, France, Hungary, Germany, Switzerland, Italy, Bohemia and the Ukraine. the Ukraine in small numbers of individuals so far tested." Alan, there is a good summary level paper from the Riva del Garda conference that is in English but I'll have to scan it and send it to you. I find the heavy Iberian presence of DF27 clades and the scatter nature of DF27 very tempting to link with early maritime Bell beakers and probably represents the Iberia aspect of the beaker culture network. As I posted above, it seems very unlikely that L21 and U152 are 'out of Iberia'. Iberia would seem likely to have once been nearly totally DF27 prior to later arrival of L21 and U152 on its fringes. The latter two obviously by definition cannot be derived from a DF27 lineage. Ultimately I think it will be revealing where (if anywhere) P312XDF27XL21XU152 is concentrated and I would bet its not Iberia. Somewhere to the east in SE France or even further east in the Alps or south Germany (basically west-central and west Alpine Europe) would seem more likely to me. That paper looks very interesting. I will have a read of it later. I have to thank the Normans for the fact that although the English language may be Germanic at root they transformed it so much that its easier to read French than German for an English speaker. Quote from: alan trowel hands. Here is a good post from polako explaining the pitfalls of using ADMIXTURE. So it remains that meso iberians were quite different from their neolithic counterparts. Well, we have yet to sequence any Neolithic Iberians to see if they are quite different from the Mesolithic Iberians, if you mean that the Mesolithic Europeans were quite different from the Neolithic counterparts, then I’d say that based upon the current evidence, it appears so, yet, the evidence is widely geographically distributed, and geography could indeed account for the observed variation. Yes La Braña HG are slightly closer to the Swedish HG than to the Swedish farmer Gok4. BTW, where were you going with gok4? Were you trying to say gok4 was highly "northwestern" and kinda close to brana, so "northwestern" is close to west meso? I’m getting at the fact that Gok4, the Swedish farmer was assumed to be purely representative of Neolithic types, and the Swedish HG to be purely representative of the Mesolithic types, but it appears that Gok4 might have had some Mesolithic ancestry herself, so the amount of Mesolithic it is yet to be determined. Hence using Gok4 as a proxy for Neolithic ancestry isn’t such a good idea. 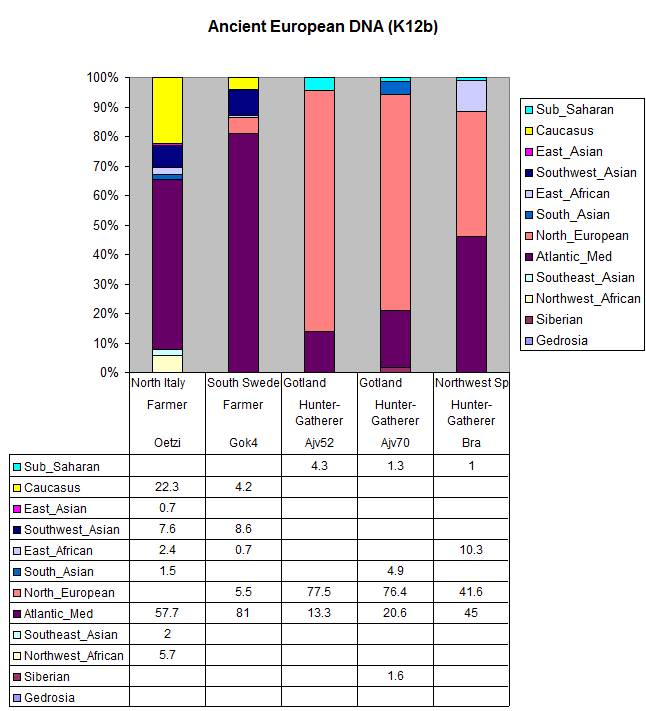 Here is a good post from polako explaining the pitfalls of using ADMIXTURE…. ^ It's hard to say who the La Brana remains were close to, because the authors of that study used a large number of Finns in their intra-Euro comparison, which probably confounded the results. On the other hand, Dienekes merged the two samples. Vadim didn't, and his results showed that one of the La Brana had farmer ancestry. But doesn’t anyone here see the flaw in the logic of Polako? Bra1 appears to have ~30% of the cluster that Vadim labels as AM-Neolithic. Now the question stands, how do we now that the cluster is even real? Moreover, doesn’t the sole presence of such cluster on a Mesolithic European automatically disprove the idea that the cluster is of purely Neolithic origin. Also, there was likely more than one Mesolithic cluster in Europe, and the idea that there is only NE-Mesolithic (Northeastern) ancestry in Europe, appears very biased to me. After all, ADMIXTURE is a computer program, and it tries to find the best fit for the given populations, it as a computer program doesn’t distinguish between Mesolithic or Neolithic clusters, it is up to us to appropriately label the clusters. So we model our hypothesis to fit the empirical data, not the other way around. That’s is, if I predict through a computer model that a population would have X number of mutations after A number of generations, and it turns it has Y number of mutations, which is outside of the range of error of X, then I have to remodel my computer program to try to find a fit that would agree with the observed data, not discard the data based on the theoretical results. It is quite ironic, that Polako would use an ADMIXTURE results to try to argue for farmer’s ancestry on one of the Iberian Mesolithic HG, after having explained the pitfalls of ADMIXTURE and STRUCTURE. The Copper Age cultures of Italy continued their burial tradition throughout the BB period, so much so that Bell Beaker burials are rare in Italy and most Bell Beaker finds are from shards found in settlements. They seem to have taken a fancy to the Bell Beaker pottery, but didn't think enough of them to use them in their burials. Mind you, they used their own drinking vessels for burial purposes and those resemble those found in the Copper Age Balkans. As for the Gaudo Culture (3300 BC), they are thought to be IE people (see Mallory) and their culture is similar to the older Rinaldone Culture (3600 BC). Plano-occipital Brachycephy makes up such a high percentage of Gaudo Culture skulls that they are almost always tied to an incoming wave of new people. The most popular mention is Anatolia by way of the Balkans. Perhaps Gaudo was made up of R1b, or perhaps even the earliest J2 in Italy, it's hard to say. With the Rinaldone Culture of Tuscany and Latium, everything points to them being IE speaking R1b and several have attributed the spread of metallurgy into France to the Rinaldone Culture. the cluster is even real? Moreover, doesn’t the sole presence of such cluster on a Mesolithic European automatically disprove the idea that the cluster is of purely Neolithic origin. Agreed! He is completely begging the question. What's even stranger is that Bra2 has more "meso" than ajv, and Bra1 has about the same amount of "meso" as ajv. So, together bra1-2 has more of this presupposed, exclusive, meso than the gotlander? Ya, I won't bother analyzing his inconsistent comment any more. They are often compared to Remedello too arent they? I had a read about them some time ago and I thought the case for them being IE was pretty good. The ice man was linked to Tamins-Carasso-Isera 5 but had Remedello influences too. Let me clarify that DF27 does look Iberian and SW French... but I never said it originated there. Surely you must know there is a big difference. I do know that, and would have sworn you had said it originated there (in the context of a widely admired, mostly blue map); but if not, I apologize for the implication. Some place near the Franco-Italian border and close to the Ligurian Sea, the first carrier of L51* was born. This mutation would be carried by the Chasseen-Lagozza-Cortaillod Cultures and would produce L11 somewhere near central France. From there, all other branches would expand – U152 back to the Alps, DF27 to SW France and Iberia, and L21 from NW France into SW England. So, if I have somehow misinterpreted what you meant by those remarks, I apologize for the misinterpretation. But they are anyway your remarks, to which I was alluding, and with which I still reserve the right to disagree -- admittedly on the basis of public data in FTDNA projects, which you don't want me to look at for purposes of argument, so that's a stalemate but not a checkmate. I noticed a few posts up on this thread that Chris1 has also seen these obviously non-Iberian, non-French and non-Mediterranean instances of DF27, way the heck to the east of France. I'm not imagining it -- but I concede, at least, that it remains to be proven where, and when, the DF27 SNP happened. And in which direction its daddy might have been migrating, at the time. There are a lot of options, of which the lower Rhone may well be one. Oh boy, here we go again. Like I said - DF27 is Franco-Iberian today, and of course I know that does not mean it was born there. If I refer to DF27 as Franco-Iberian, or more aptly Ibero-French, it is because it more than likely makes up anywhere from 60-80% of northern Iberian lineages. You can point out references to instances "way the heck" out all you'd like, but nobody is going to put too much stock in them given the source of the data. Heck, the U106 project has a sample in Cyprus and I've never heard of anyone developing a whole theory around it. Now, do you have something constructive to add to the topic, because I think we are probably boring everyone to death. If Mike Walsh and Hans van Vliet come to some sort of consensus about the age of DF27, and it's nowhere near early enough to be spreading eastward from Iberia with the first Bell Beakers, this is constructive. And IMO probably has to do with a rather later wave (if that's the word) of Bell Beakers -- later than 2900 BC -- who were spreading westward to Iberia, maybe speaking proto-Celtic of some sort (unless/until they happened to settle down with the Basques, etc.). That's not the picture painted in Celtic from the West, and it has its own problems; I just think the Y-DNA timing (of DF27 and its subclades) appears to work out that way, and therefore bears looking at. However, I don't think migrants across Europe, or around it (by either a northern or a southern sea route), have ever had to migrate one haplogroup at a time. Nor that each branch of the Indo-European language family may logically be identified with one SNP. I hope you are not waiting for me to declare something related to TMRCA calculations. I am not smart enough to want to enter that fray so I just go with the smartest guy I know - Ken Nordtvedt, and his methodology which appears both innovative and logical - Generations interclade estimates. TMRCA estimates are not very precise anway, which is why I prefer to look relative variance among known groups of related people to see what relationships remain consistent. That only gives you relative timing, but I figure that is useful in and of itself. I hope you are not waiting for me to declare something related to TMRCA calculations. Nope, but Hans has begun declaring some things, based on your sorting of the SNP-tested guys you have found in projects. If Marko Heinila weren't busy doing something else, he might be in this fray. Klyosov has his own approach, but his results are getting more similar to those from Nordtvedt methods (and btw getting younger). It's a little off-topic, here, unless we start equating the expansion of haplogroups with expansion of their respective language families. They almost certainly are related, but not 1:1. A given TMRCA age prediction, however imprecise or subject to later refinement, is a terminus post quem for its SNP (as represented by a current surviving lineage). And finding that SNP in an aDNA sample gives us a terminus ante quem, so it's bracketed. We are barely beginning to see examples of that. The most recent SNPs are likely to be the first nailed down, as e.g. Klyosov and McEachern think they got one nailed down a few years ago ("Scotland's R1a1 Highland Clansmen"). M153 is getting close, since there's a dated "ancient" grave find of it (Aldaieta) that approaches within about 250 years of the predicted date of that mutation. Once the genealogy side begins to segue into the genetic anthropology side of this exercise, it will be a lot less abstract, and should interest a broader public. Specialists in Indo-European linguistics will be part of that public. And then the TMRCA digression in this thread won't be off-topic. Heck, the U106 project has a sample in Cyprus and I've never heard of anyone developing a whole theory around it. I’d add that Sino-Tibetan is close to the Eurasian family (probably developed in North China) as I think having demonstrated in a paper of mine (of more than thirty years ago and unpublished, but read by illustrious linguists like Vittore Pisani –I have a letter of his - and Romano Lazzeroni).